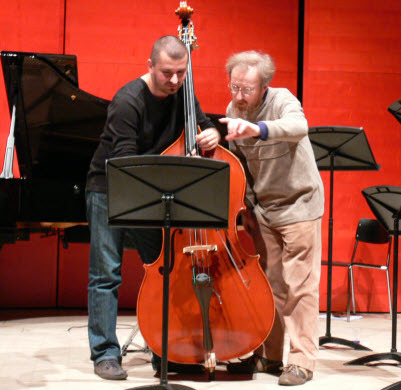 The Paul Klee Ensemble via Fabio di Casolá and Kaspar Zehnder commissioned a concertino work for double bass and ensemble entitled Storyteller for a concert on the theme of childhood in Bern in January 2011. The soloist was Ivan Nestic who also gave considerable help with the writing of the bass part. "Storyteller" conjures up "a picture of storytelling" rather than describing any specific plot. I imagined a spellbound gathering of people around a crackling fire in the dark of night, manipulated by a slightly sinister character, casting flickering shadows and weaving his yarn with well dramaticised twists and turns. We all like to be scared a little by stories! After a brief "curtain up", the piece divides into three sections: fast-slow-fast. The solo bass both tells the story (via the ensemble) and comments upon it, sometimes stepping outside the narrative as if he were interpretting it with "asides" to his audience, who themselves occasionally react. The whole scene has a slightly malevolent air, with a "dark energy" and much animation, but, as in all good fairy stories, there is a happy ending!